The fall fly fishing invasion in North Carolina really began in mid-September. Over the last few weeks, I have been fortunate to work more visitors from Europe and Oceania than ever for the fall. 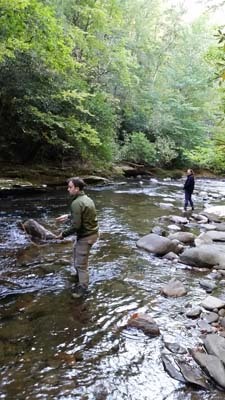 Many think of Western Carolina as the “stock trout” bashing that goes on from the first of October to the First of June. What they do not know is the Great Smoky Mountains National Park has over 2,900 miles of wild trout water. This number was just released from the fisheries biologist. In addition to this is thousands of miles of Nantahala National Forest streams. Epic choices based out of Bryson City! During the last few weeks, I have been very fortunate to work with folks from Australia, New Zealand, Germany, Switzerland, Austria, Japan, England, and Scotland in addition to folks from America. Puzzling, to say the least with all of these foreign trips but I am thankful to have met some incredible folks. 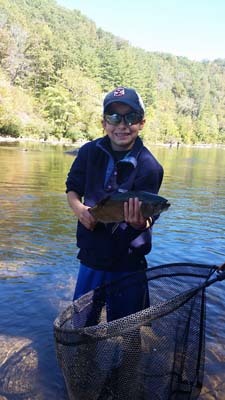 Fly fishing creates an avenue for forming new friendships with great surroundings. Fall is such a great time to be in NC! It also provides me with learning new things from other cultures. It is very different circumstances here before the delayed harvest streams opened back up in early October compared to the wild trout waters in the Great Smoky Mountains National. September was better fishing in the park using dry flies the majority of trips. Better quality fish were taken on small dries for most of the month. These days in September required much better line control overall for greater catch ratios. Technical conditions to say the least! The lack of rain created some of the lowest water levels ever for many of our streams. Very long leaders with small dries make it much easier to contend with skinny water. I prefer these conditions more than the stocked fishing on the Delayed Harvest for trips because the challenges are much greater overall. The Delayed Harvest program provides one of the best studies of fish behavior. I prefer to go to the same water the first few weeks for observing these changes. The stocked fish bashing sessions typically begin with double streamers of continuous hookups back to back. Every fisher tends to stay happy the first few days because successes are high to the masses. Once the chasing of patterns slows down, we begin to actually work the system for cracking the code! The process of figuring out what to do next is more complex in my opinion than ever before with concept of catch and release. We train those same pods of fish to become more and more selective to avoid being hooked! Anglers of days gone by would have never cracked the code for creating super fish when you think about it. They harvested fish for the table for the past 10,000 years in practically every example you want to study. It is a great thing to know that something you release may put a smile on another anglers face! What I am pointing out is that at the same time these types of programs also create fish that will adapt rapidly to become more selective in short order. The fish numbers prove this every year of the delayed harvest programs with some of the largest number days for trout landed. Opportunities await you for the fall fly fishing invasion in North Carolina!